Kirkuk provincial council held its first meeting on Tuesday April 9 following an 18-month-long halt. 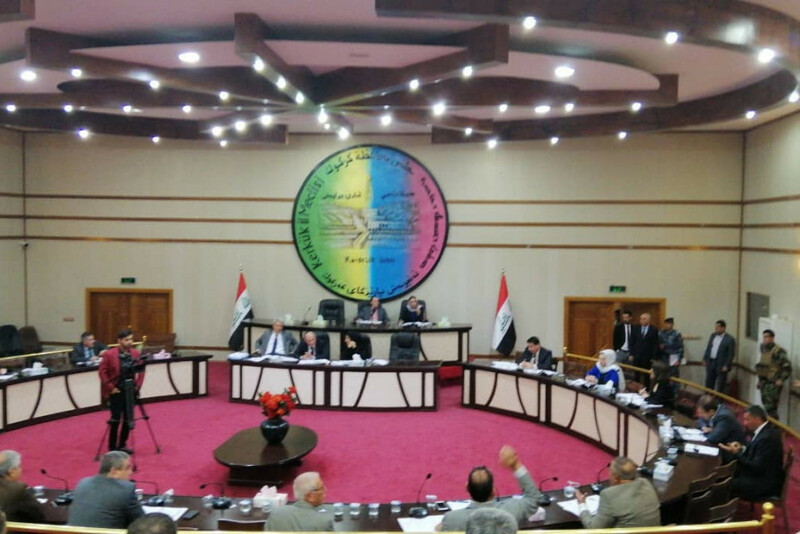 Despite the absence of Kurdistan Democratic Party members of the council, 21 members, including the interim head of the council present completing the quorum needed to hold the session. The meeting was devoted to discuss a range of issues including the provincial budget. Earlier, Jamal Mawlud, interim head of the council told KirkukNow he was unable to attend the meeting due to illness. At the beginning of the planned meeting only 20 of the out of 41-member council were present raising fears that the meeting would fail due to lack of quorum, before Jamal Mawlud arrived and completed the quorum. The Kirkuk provincial council is made up of 26 members of the Kurdish brotherhood list, 9 Turkmens and 6 Arabs. The meeting was presided by acting head of the council for financial affairs Jamal Mawlud who has been assigned by the Iraqi government to replace Rebwar Talabani who fled Kirkuk following the October 16, 2017 events and is currently in Erbil. Askari said the meeting decided to re-activate the council’s committees and also discuss the petro-dollar budget allocated for the province within the federal budget. He added that discussions will continue over the next two weeks on how to spend the petro-dollar budget to carry out projects in the province. The Kirkuk provincial council meetings has been brought to halt for nearly 18 months due to a boycott by KDP members of the council who form the majority of the Kurdish brotherhood list. Although the meeting was planned for February 18, 2019, disagreements between the PUK and the KDP and other components resulted in an indefinite delay of the meeting.